Return to main George Klee page. George Klee was born on 8 September 1879 at Waitati 20 kilometres north of Dunedin. His parents were both born in France and his father was Victor Klee. He attended Waitati Public School with at least two brothers Louis and Victor who also served in the 7th NZ Mounted Rifles. He was employed at Gisborne as a shepherd for Mr J. McIldowie from July 1900 to February 1901 when he left to enlist in the 7th NZ Mounted Rifles. George trained as a blacksmith. He enlisted for service during the South African War on 3 April 1901 and served as a Trooper with the 7th New Zealand Contingent, seeing action in the Orange Free State and the Transvaal. While in South Africa he suffered from a severe bout of pneumonia. On return to New Zealand he was discharged and went back to Gisborne where he was employed as a baker’s driver for Mr F.J. Oatridge. George was a member of the Gisborne Rifles Volunteers but uncertainty surrounds the exact period he served. He then made his way to Wellington where he found employment at parliament as a messenger for the Premier, the Right Honourable R.J. Seddon. When George decided to enlist in the Permanent Force, he was armed with a letter from the Premier (who was also the Defence Minister) “I wish the bearer of this, G. Klee, enrolled at once in the Permanent Force. The date of enrolment to be as from the 1st inst. R.J. Seddon, Defence Minister.” One wonders if Captain R.J.S. 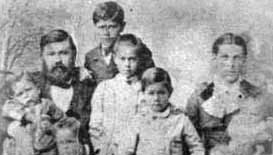 Seddon (the son of the Premier) knew him from the time both men were in South Africa. George enlisted in the RNZE as a provisional Sapper on 11 August 1903 and was attested at Wellington where he carried out his initial training and drills. Six months after joining he was promoted 2nd Class Sapper having successfully completed his period of probationary service. George was employed as a cook at Shelly Bay, Wellington. On 1 October 1907 he remustered as a Gunner at the time when the RNZE was absorbed into the Electric Light Section of the RNZA. He then moved to Fort Dorset where he was employed in the Electrical Section. It is presumed that he was involved with work on the Defence vessels for the greater part of his service career. During 1917 George was charged for losing electrical stores at Fort Dorset but he appealed against the ruling that ordered him to pay for their loss. He had previously been ordered to leave the key for the store where it could be easily obtained by almost anyone – particularly when he was on leave or absent elsewhere on duty. It was also pointed out that Territorials were able to have access to these stores and that their night parades were not closely supervised. It was noticed that some clothing had been gained by some of these men and worn without right. Promotion came slowly for George as he served fifteen years before he was promoted Bombardier on 1 December 1919. He was promoted temporary Corporal on 1 February 1920 and a year later his rank was confirmed. During 1920 he was working at the Pukeora Sanatorium doing work contracted under the Director of Works. This task was completed in a short time owing to the hours that Cpl Klee worked – on one occasion remaining on duty for 36 hours. He did not receive any monetary of leave compensation for the long hours as did the other workmen and the travelling expenses he was paid were subsequently required to be repaid. His OC wrote on his behalf seeking redress of this situation but it is not known if this occurred. On 6 May 1921 the award of the Long and Efficient Service Medal was approved for CPL Klee and a few months later on 20 August he was also awarded the Permanent Forces of the Empire Beyond the Seas Long Service and Good Conduct Medal. During 1922 Cpl Klee was employed on a demolition task removing rocks in the Kaikoura Harbour when he suffered a fall. He slipped on wet rocks while recovering a failed charge of guncotton and he did not want to let the explosives he was carrying fall in case there was an explosion. He burst a blood vessel in his left leg which immobilised him for a day or two. L.SGT Klee received his Long and Efficient Service Medal at Kaikoura signing the receipt on 14 March. George Klee was promoted Sergeant on 1 February 1925. 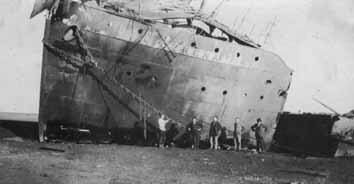 An early task after this promotion was to go to Wanganui together with RSM Smith and Sgts Gerrard and Woodward and demolish the wreck of the SS Cyrena there. The ship was carrying a cargo of case oil and had run aground on a mushroom shoal formed by sand mounting round and over a sunken log. The ship suffered severe damage, the bottom of the vessel was found to be split right across and she eventually broke up behind the bridge. The Cyrena was 288 feet long, beam 39 feet and of 2,138 tons gross. No doubt it took some time to cut up. Fort Kelburne above Ngauranga in 1964, when the Historic Places lost its appeal to have the old castellations preserved and after demolition had begun. A reference to another minor injury shows that Sgt Klee was involved on duty at Fort Kelburn in 1927 and late the same year he was made aware of a transfer to the General Duties Section in early 1928. On 28 February 1928 SSgt Klee was transferred from the RNZA, promoted W01 (Sergeant Major Coxswain), and appointed Master of the Defence Vessel Janie Seddon. He remained with this vessel until 1940. George Klee had attained the normal age for retiring on 8 September 1934 but was extended until he reached aged 60. On 28 August 1938 further approval was given for him to remain in service until 28 January 1940 but the outbreak of the war necessitated his services being retained. On 6 March 1940 he fell down the hold of his ship and sustained injuries to his right shoulder, fractured some ribs and injured his left knee. This resulted in his retirement on medical grounds having served for more than 37 years. He was retired on 31 December 1940 in his 62nd year. It would suggest that he was also entitled to two WW2 service medals in addition to those he is shown to have received. 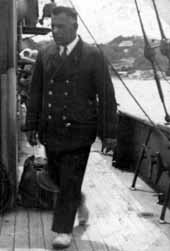 W01 George Klee was also qualified as an electrician, was regarded as a trustworthy, reliable and efficient Warrant Officer who kept his ship in good condition and required little supervisory management of his vessel. New Zealand Long and Efficient Service Medal.